Through many years of hard work and sacrifice, living as a poor man even through prosperous times, I ended up saving away quite a bit of money through out my working life. In order to save money, I forced myself to give up on on many luxuries, and one of the things I gave up, that I will be using for an example in this article, was pies. I love pies, but have not bought one over a decade, they may be inexpensive where you come from, but for me they were the cost of two-three meals, and did not have enough value for me to keep spending on them. About six years ago, being forced to move and sell my home, I decided to take the savings and invest where the news, my peers, and the banks, all told me to, mutual funds. I was told through no additional work on my part, that I would double my money in about five years, it sounded like a great idea. I did some research, took the Bank’s Investment Manager’s advice, and signed some papers. I thought I was so smart, by resisting buying myself a pie that day, and waiting five years, I would then be able to buy two of them. I thought that was great, after all I was only 34, I should still be alive at 40 and get to eat my two pies right? Now that it has been five years, and the bank said at this point my money would have doubled, you would think I could get my two pies now right? Believe it or not, somehow I am only stuck with about halve of a pie. Not only has my money gone down, but inflation has been going up. I had invested in funds containing only blue chip companies, and they had used my money to help turn record profits over the last five years, so it is a bit strange to me that I should actually be losing money. Did I not invest in a company? Should it’s profits not be my profits? Something is wrong here, I understand about the stock market fluctuating up and down with demand for the stock, but where did my share of the profit go? Why on earth do I invest in companies, if during times of profits, I somehow actually lose money?! The market is down about 11% since I bought, but my mutual funds are actually down more? How is this possible? Do all those little electronic transfers from my bank to the investment really take so much manpower, hard work, and energy that it needs so much of my money just to pay for itself? Should I eat this part of a pie now before it is all gone, wait and be satisfied once my whole pie has been returned to me, or hold out for the two pies that I was already supposed to have by now? 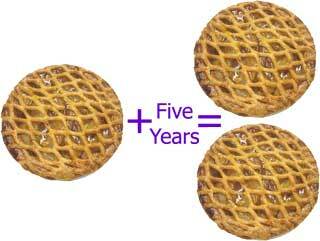 If the banks lived up to their promises, in another five years, all things being even, I should actually have four pies. I no longer believe that even two pies are possible anymore, I mean with the record profits of the last five years, and me losing money, is there really any hope for the future? Money does not disappear, it only moves around, my money was not sucked into a black hole and erased, it moved from my bank account, into others. Due to the large bonuses corporations are paying themselves, as well as stock traders, mutual fund managers, bankers, and all the other “professionals” that are involved in my supposed “Wealth Management” actually get to not only use my money, and keep all my profits, but if I sold them today, also about 30% of my initial investment! Amazing isn’t it ! Buying into mutual funds is not supposed to be gambling, it is supposed to be an investment, you give your money to investment groups, who put your money into actual corporations to help them grow, and after they grow, they are supposed to give a share of the profits back to you. Of course if they lose money, you lose money, but recently as they make money, you lose money!! Rather than the dream pictures the banks paint you of Mutual Fund investments, let’s have a look at an example of something a bit closer to reality. Have a look at a short clip from South Park below. I can hear you all screaming at me now, that when the stocks go up, so will my investments, I hear you, but it is not proportionate to the inflation or the profits the companies have earned. There is too much wealth being absorbed by the people at the top, and virtually nothing trickles down to the investor anymore. 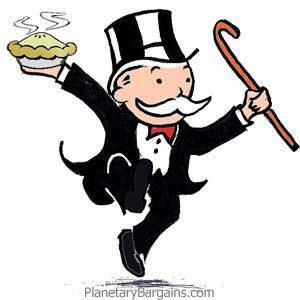 Mutual Funds seem to be broken, and if my full pie ever returns, I will be investing either directly in high dividend stocks, property, or most likely my own company. A friend of mine has no savings at all, he never has, he eats his pies every time he gets enough money to buy one. I used to tell him he should save his money, and get more pies in the future. Now though I am having a good look at myself here. I have not afforded myself a pie in about fifteen years, I should be able to afford rooms full of them now and eat until I explode from them, but I cant. I can see now that I am the fool, to be taken in by such a massive scam. I understand why people are currently protesting all over the western world about the financial situation, most of them can’t quite put their finger on why employment is so low, crime is up, investments have shriveled up, inheritances have disappeared as some people have not just lost their jobs, but also their homes. The rich have gotten so wealthy, and the middle class are disappearing. Something is wrong. All the savers of the world, the newly poor, and all their families, should be chanting out on in front of the Banking and Business Capitals of the World. “Who’s eating my pies?” because we all know that somebody is. PBS, a very incisive view of the average person’s financial dilemma. How to make the most of one’s money while one still has some. Fortunately or unfortunately, I’m one of those lunkheads who has never given a second’s thought to any of this, simply depositing my money in the bank when I didn’t need it and withdrawing it when I did. I’ve always followed Thornton Wilder’s advice and somehow I’ve managed: “My advice to you is not to inquire why or whither, but just enjoy your ice cream while it’s on your plate.” So your pie analogy isn’t lost on me. A pie in the hand is worth two in the bush. Thanks for visiting NP, always good to have you here. I like your quote about the ice cream, I guess that is the secret, just to enjoy it while you can. PBS, what a clever explanation for the horrible financial situation most of us suffer! Loved you metaphors. Man cannot live on healthy food alone. He needs pie once in a while! Otherwise, what is the point of living? Focus on the moment, stuff your face with pie, and feel good for a while. As for the economic situation, (ha! situation! !–CRIME) I wholeheartedly agree. You told me you believed that a shuffling of power is going on. If that is so, I want to stay away from the new power structure. Ideally, I would like to live off the grid. But it’s not possible for me. And, in the long run, I wondered if anyone can stay off the grid with Big Brother gaining strength! I think there is a world shifting of power going on back to the US, through a currency war, but the struggles inside the countries are a different thing. Although possibly they are both led by the same group of people. Admittedly in my assumptive, uneducated opinion, the average Joe inside a country seems to be increasingly weaker each day, though I would say still stronger than the 1950s defiantly less strong than anything 1970 onwards. I really hope there is mass, short-lived, protest in the streets, not to lead to violence or anarchy, but to more banking regulations, better schooling, higher taxes on the rich, more social services, an end to the current wars, and a higher minimum wage. Though I think most people are too hypnotised by televisions, computers and video games to take the time to protest. All the power seems to rest in the hands of the super rich these days, and the opportunities for the average joe to climb up out of the mud seems to be disappearing very fast. In the US I think you all should vote for some of the political parties that are not Republican or Democrats. If you want real change that would be a good way to go about it. Although they would end up being corrupt also most likely, the more parties you all support the harder it is for big business to spread the money around, and there is more competition for your votes. Bi-Partisan agreements sound more like a dictatorship, than a democracy to me, but I do understand how it is necessary in a self-imposed “two-party system”. Banking, investments, money management in general, –sadly are all things I have no clue about. I just try and save what I can. I dont hold out any hope that things in this current system will change for the better. —But I hope you get your pies. I am constantly learning the hard way about finance and investing, it is not easy, things tend to change quite a bit. I would be happy getting my pies back, in fact, if I had it my way, there would be pies for everyone ! Best to enjoy your pies while you can ! I think we need movements against these crimes against the people–but with organization and good leadership. I don’t think we have that now. To go out and protest…well, only the strong and usually young can stand that kind of stress. The rest will follow, if they are in enough pain. Perhaps the powers-that-be will stop short of that scenario to avoid having too many people against them. One can only hope. I generally agree with your point of view on the situation in the US. You seem to know us well…! I fully agree that the breaking of the 2-party system could help and won’t hurt. Anything to sap power from the greedy few! It is not hard too understand the US as a Canadian, we are very simular. Recently Canada tends to follow most US laws also, that is why things in the US always worry me so much. I did previously make sure he understands he might spend less his money, and acquire large pies down the road. Now though We are creating a good examine myself here. I am constantly re-examining this also, it seems to make more sense to invest in something physical like a place to live, or a business to work at, than paper. The problem is that it is hard to get to a level to buy a home or business, and the banks don’t really seem to be helping. I really loved the video. Yes, when South Park has a message, they always seem to say it best. You are right about the stock market investments these days. I especially feel for the retiring folks in this economy, all their hard-earned money disappearing overnight, and coupled with that the rising cost of health care. Hard times, and hard lessons learned. 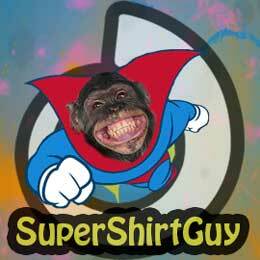 I am fortunate I am still working and have a job, thankfully I used some of my savings to start this website and the e-commerce store on it, but it is still not easy watching money that supposed to be safely invested go to people that are actually paid to make it grow. Some day I would like to put Pies back on my shopping list. Thanks for the visit and comments SB. Yes something smells funny in the kitchen, and its time to cut off the gas to the fires. Mutual funds are dead, the greed killed it. May there be no Pies for them in Hell ! May there be no pies for them in hell indeed, but may there be pies for the rest of us.